My eating cleanse has been over for a week – and it couldn’t be over in a better time – just a day before my vacation to Santa Fe, New Mexico (more on the vacation in upcoming posts). I am back to drinking coffee and wine, eating animal proteins, and having an occasional bite of chocolate. I am not leaving the cleanse empty handed, however. One of my favorite meals that came out of the cleanse was this Red Quinoa Salad with Avocado – it is vegan, gluten free, and packed with protein. 1. Combine lemon juice and red onion at the bottom of the mixing bowl and allow to marinate for 5-10 minutes. 2. Stir in quinoa, avocado, tomato, cucumber, arugula and basil. 3. Season with olive oil, balsamic vinegar, and salt and pepper to taste. You can eat the salad right away, or let it sit at room temperature and allow the flavors to meld together. Clearly, variations are endless. You can use spinach instead of arugula, add slices of sweet bell pepper, and your favorite herbs. I personally love the combination of peppery arugula with whole leaves of sweet basil. 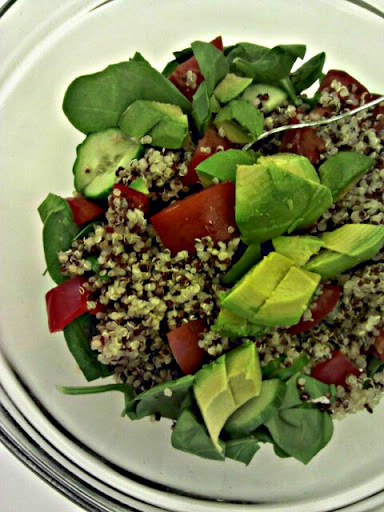 Avocado and quinoa sounds good and looks so delicious!! I will keep this recipe for a Sunday brunch.